To achieve the ambitious habitat goals of the American Woodcock Conservation Plan, management on private lands to increase young forest, or early successional habitat (ESH), is critical. In 2008 the Wildlife Management Institute contracted with D.J. Case & Associates to "Investigate communication strategies to integrate private landowner habitat management interests and capacities into programs designed to implement the American Woodcock Conservation Plan through identification of critical audiences, testing of key messages and documentation of optimal delivery mechanisms." After nearly two years of information gathering and research, a Comprehensive Communications Strategy (pdf) was released in December 2009. The Communications Strategy focused specifically on owners of small (10- to 100-acre) woodlands in the 10 states that are part of Bird Conservation Regions 14 and 28 (Maine, Connecticut, Vermont, New Hampshire, New York, Pennsylvania, Ohio, Maryland, Virginia, and West Virginia). This project was not designed to address communication needs of large landowners, industrial landowners, or public lands. However, the work is designed to provide foundational insights, approaches, and communications strategies that may be applicable in other areas as well. Separate reports that provide much more detail on every aspect of the background research appear below. Literature Review (Annotated Bibliography for the Investigating Communication Strategies to Support Implementation of the North American Woodcock Conservation Plan Project) – the Team collected and reviewed pertinent literature regarding private, non-industrial woodland owners and the management of their forested lands. Interviews (Summary of Semi-Structured Interviews with Natural Resource Professionals) – the Team identified and spoke with 30 key natural resource professionals who engage in early successional habitat management and outreach on private lands, to learn about their efforts, messages, audiences, and assessment of such efforts. 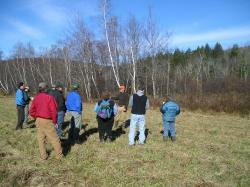 Phase I (Summary of Focus Group Meetings with Private Landowners) – the Team conducted four focus groups (one in New Hampshire, one in New York, and two in Pennsylvania) with private, non-industrial woodland owners to determine the fundamental reasons why they might choose to either actively manage their land for early successional forest habitat or not, and to test the appeal of potential messages that might be used in a communications and outreach campaign aimed at increasing the acreage of private lands being managed for early successional forest habitat. Phase II (Message Testing Focus Group Meetings with Private Landowners (Phase II)) – the Team conducted an additional set of three focus groups (two in New York and one in Pennsylvania) to test communication vehicles (images, messages, tag lines, and print ads) that might be used to encourage private landowner participation in early successional habitat management, and to compare and contrast the characteristics of Phase I focus group participants with those of this Phase II focus group work. NWOS Survey Analysis (Analysis of National Woodland Owner Survey Data for Bird Conservation Regions 14 and 28) – the Team reviewed results of the National Woodland Owner Survey for small woodland owners in Bird Conservation Regions 14 and 28, to determine understanding of and attitudes toward forest ownership and management, and other conservation issues. They also compared demographics of and results from survey participants with participants in the Phase II Focus Groups, to determine to what degree focus group participants were representative of the broader woodland owner population, and whether results and insights obtained in focus groups could be applied to the broader population. These are final results from a two-year study funded by the Webless Migratory Game Bird Research Program of the U.S. Fish and Wildlife Service. The Association of Fish and Wildlife Agencies has created a Migratory Shore and Upland Game Bird Support Task Force. In 2009 the task force convened a workshop of American woodcock experts to develop a strategy for obtaining information needed to improve habitat- and harvest-management decisions that affect woodcock. Participants included representatives of nongovernmental organizations, universities, and state and federal conservation agencies in the United States and Canada. 1. Develop a demographic-based model for assessing woodcock population response to habitat- and harvest-management decisions. 2. Develop communications strategies to increase support for policies and practices that benefit woodcock and other young-forest wildlife. 3. 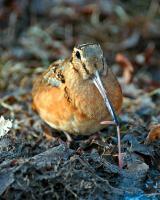 Improve understanding of migration, breeding, and wintering habitat needs of woodcock. 4. Improve the current Singing-ground Survey. Meeting these needs will reduce uncertainty in current management practices. Careful science will let managers better target site-specific and range-wide management and monitoring programs, improving the cost-effectiveness of habitat-management steps being taken to boost woodcock numbers (which simultaneously benefit the many other species of wildlife that share the woodcock's habitat). The strategy is intended to increase funding for management and research activities over the next 5 to 10 years through thoughtful and deliberate planning built on sound scientific principles. Priority Information Needs for American Woodcock: A Funding Strategy (pdf) was published March 15, 2010.